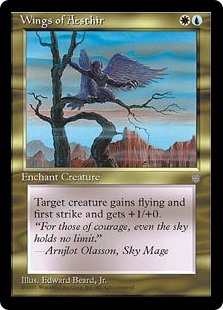 I recently splurged on a bunch of legacy Magic The Gathering booster packs, as I've been known to do in the past. I'll let you in on my little secret: I let the 1% cash-back on my credit card build up for over a year, then I blew it all on sixteen pristine legacy booster packs from the 90s & 2000! Everything after that was history. 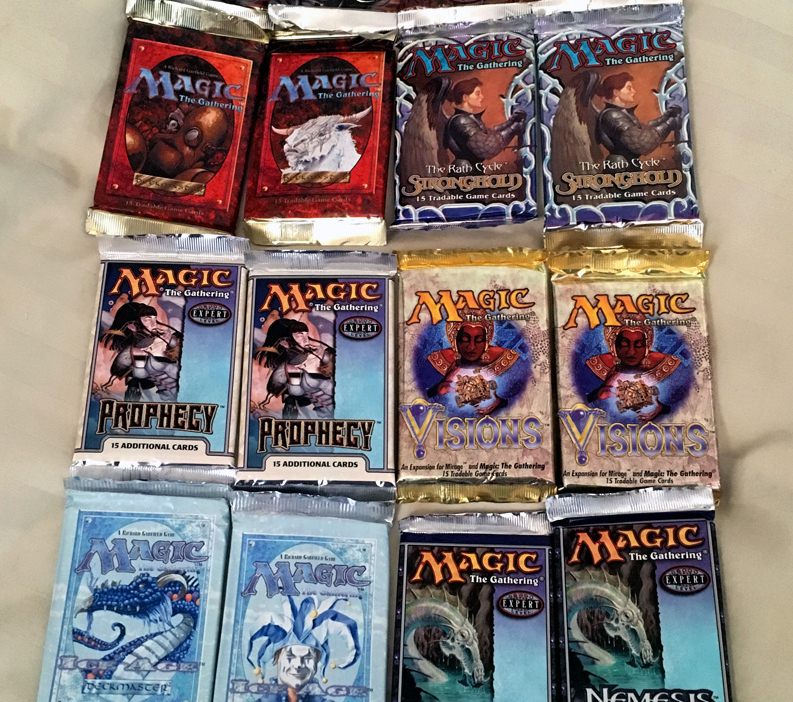 I dropped a few text messages to some very lucky friends, we cracked open a few beers, then indulged ourselves opening up these ancient Magic The Gathering booster packs while drafting some awesomely nostalgic decks. Some of these packs were over twenty years old! Which is kinda crazy to think about. I'm amazed these packs even exist unopened anymore. For this draft I decided I wanted a large variety of editions to spice things up. I ended up buying two boosters of each of the following editions: Exodus (1998), Fourth Edition (1995), Ice Age (1995), Nemesis (2000), Prophecy (2000), Stronghold (1998), Visions (1997), and Weatherlight (1997). Fourth Edition was by far the most sought after in the draft. 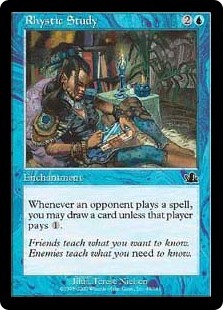 Likely because the cards in Fourth Edition are such a staple in any legacy deck. So I think having a few Fourth Edition packs in here made this draft extra fun. Every time someone was passed a stack of Fourth Edition, they were like, "Oh yeah, now that's what I'm talking about!" 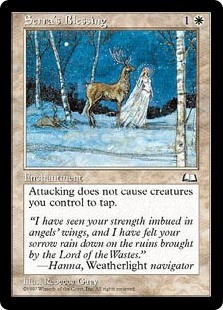 I also quite enjoyed the Ice Age boosters, which I think is my favorite edition of all time (either that or Fallen Empires – which are awesome, don't let anyone tell you differently). 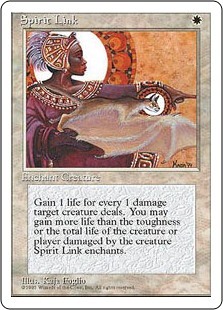 Some people buy expensive wines, some like fancy cars, but me, I buy vintage Magic cards. This bit of self indulgence wasn't cheap but I think it was worth every penny! Because you can't put a price on happiness. Below is the deck I drafted, and I happen to really like how it came out. I was inches away from winning the four player game, but I actually ran out of cards! Likely due to the Rhystic Study. It's a blue & white creature deck with more than a few tricks up its sleeve! I think the most notable cards in this deck are Rhystic Study, Serra's Blessing, Spirit Link, and Wings of Aesthir, which all happen to be enchantments. This website is not affiliated with, endorsed, sponsored, or specifically approved by Wizards of the Coast LLC. Magic: The Gathering® images and symbols presented on this site are copyright Wizards of the Coast, LLC, a subsidiary of Hasbro, Inc.